Tract homes and communities often appeal to first-time homebuyers. Buyers like the idea of selecting a floor plan, exterior design, interior finishes, and color palette in a brand-new home. The risk lies with the first-time buyers’ inexperience in the home buying and negotiating process. They are often unaware of the extra diligence required in a new construction home purchase. 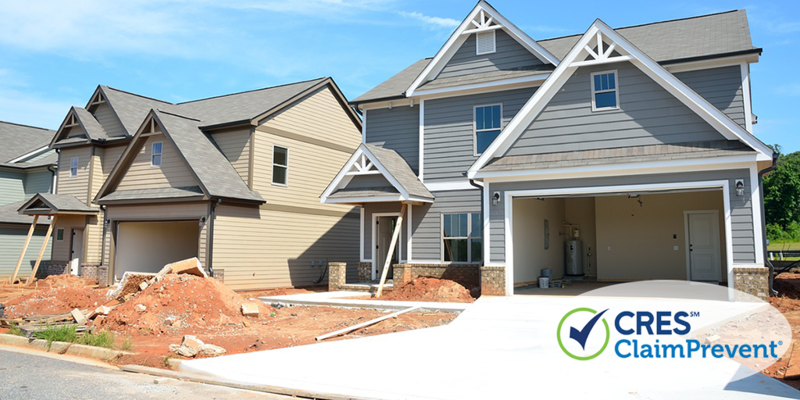 Real estate professionals must be ready to educate buyers on the key differences between resale and new-construction tract homes to protect your clients and avoid a real estate lawsuit. One of the biggest risks with tract homes involves misunderstandings around inclusions in the cost of the home. As the agent going between the buyers and the builder, it is your responsibility to clearly define the various fixtures, flooring, and accents that are included in the base price of the home. When buyers are choosing these finishing touches, it’s easy to lose track of selections. Confusion can follow about what is an inclusion and what is an upgrade that adds cost to the base sale price. You should be present during the selection process to educate your buyer on the cost implications of their selections. You will be the point person on negotiating the inclusion of upgrades at no or reduced cost. As the buyer’s agent, you are also responsible for ensuring the builder has your buyer’s selections and specifications for the property clearly documented in writing within the purchase agreement. Ensuring both your clients and the builders sign documentation detailing all finishes and selections will reduce your risk, particularly if the builders use different materials than expected or deviate from the agreed selections. With a tract home, it’s critical to recommend that buyers inspect the home more than once to protect yourself and your clients. It’s recommended that the buyer engage a home inspector to do a three-phase home inspection during construction. The inspector should come after the framing is done, then immediately prior to drywall, and finally before closing when the build is complete. Buyers may be unaware of the importance of and need for frequent inspections when buying a tract home. They also may or may not be prepared for the additional inspections cost. Buyers who fail to do inspections and then realize there’s an issue when it’s too late could direct their anger toward you. But, upfront communication can avoid this situation completely. Cover the need for inspections and associated costs with the buyers in advance, prior to negotiation, so they don’t feel blindsided or miss these inspections during the build process. As the buyer’s agent, it’s important to also communicate the potential for delay as well. If a scheduled inspection finds something unsatisfactory, this can impact significantly on the building schedule. As an example, an incorrect fall of a tiled floor in a bathroom is a major issue which will require the removal and replacement of the floor tiles at the correct angle to enable adequate drainage. Likewise, if the kitchen has been installed, but the finished material differs from the buyer’s selections, fixing this error will delay the build. The estimated build times provided by the builder are just that — estimated. As with any construction project involving multiple trades, there is potential for delay. Some builders or developers will offer incentives to encourage buyers to close on the home before construction is completed. They may offer free upgrades or money off of the closing costs. While these incentives may be appealing to your buyers, it increases risk. If your buyer agrees to one of these deals, they lose their leverage to have issues corrected by the builder. A buyer in this situation may try to hold you liable, leading to an E&O claim. Inform your buyer client of these risks in writing and obtain their signature should they decide to accept developer incentives against your advice. This will help you avoid liability for risks associated with an early closing. Some builders and developers will have a preferred lender they will try to push the buyer to use. It’s important to recognize this lender may not be the best choice for your buyer. Educate your buyers about their options outside of the builder’s preferred lender. This will help reduce your risk in being blamed for less than desirable financing terms or financial roadblocks. Entry-level tract homes can be an attractive option for buyers because of their low investment in comparison to traditional housing. The flipside of this is that the resale of a tract home may not be great, depending on the location, the finishes, upgrades, landscaping, and exterior amenities. For houses with similar floorplans and very little difference between the homes, there can be enormous competition when trying to sell. If there are no unique selling propositions, sales of tract homes can be very price-sensitive. Another factor contributing to a potentially low resale is the quality of the fixtures in tract homes. The nature of tract homes is that they are mass produced. The builders can create these homes cheaply because there are economies of scale in building dozens of homes at once. That is not to say that cabinetry, appliances and selections available for tract homes are not of a reasonable quality. But, tract homes may not offer top-of-the-line fixtures, because tract builders limit the number of selections and upgrades to keep costs down. Tract homes can be a very attractive and affordable option for homebuyers, particularly first-time homebuyers. But, as the buyer’s agent, you need to ensure your client fully understands the pros and cons of buying into a tract neighborhood. Different buyers have different motivations, of course, so if your buyers simply want a nice home to live in for the long term and have no plans to move or sell, a tract home may be a perfect choice for them. But, if your client wants a short-term investment or plans to relocate in a few years, a tract home may not be the best choice. When buying any home, there are compromises and trade-offs. To avoid facing a lawsuit from an unhappy tract homebuyer, communication is key. Advise your buyer of the need for inspections (and the costs associated), document all buyer selections and ensure it’s signed by the buyer and the builder to avoid disputes in the future. Keep in constant contact with your client and ensure they’re aware of their financing options, the building process, and the potential for delay with new home builds (especially if an inspection finds something which needs to be remedied). Real Estate Errors & Omissions (E&O) Insurance + ClaimPrevent® can also give you peace of mind to ensure you can protect your real estate business if issues arise. With CRES, you’ll enjoy Legal Advisory Services available 7 days a week and more than 20 years’ of experience protecting real estate agents and brokers just like you. No one takes your daily protection more seriously. Contact us toll-free at 800.880.2747 today.